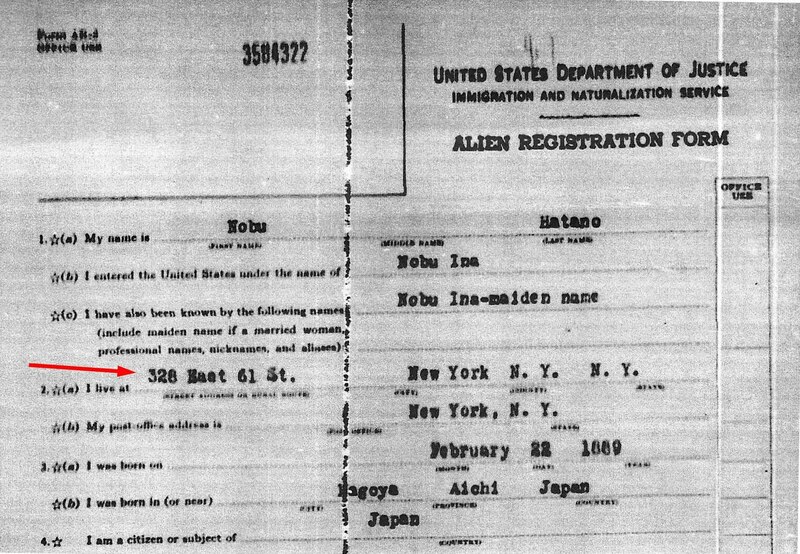 In Part 2 of the Search for Nobu Ina, one of the things that I wrote about was the Alien Registration form AR-2 that Nobu filled out in 1940. From the form, I learned that her married name was Hatano. I decided to see if I could find out who her husband was and see if this could lead me to more information about Nobu. The form didn't give a first name for her husband, so I just searched on ancestry.com for the surname Hatano in New York. I found a "Hay" Hatano in Manhattan in the 1930 census (see image below). He was 34 years old, had arrived in the U. S. in 1925, and was working as a cook in a restaurant. I didn't know if this was her husband, so I kept looking. 1930 New York census showing Hay Hatano. Click to enlarge (from ancestry.com). 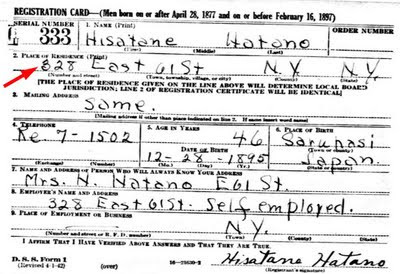 I found a Hisatane Hatano in the New York Passenger Lists (see image below). According to the passenger record, he arrived in New York on January 16, 1924. He was single and 29 years old at the time of his arrival. He was a student from Japan but had come to New York from Berlin, Germany. He spoke French, German, Spanish, and English. I still wasn't sure if I had the right person. 1924 passenger arrival record for Hisatane Hatano. Click to enlarge (from ancestry.com). Then I found Hisatane's World War II (WWII) draft record. 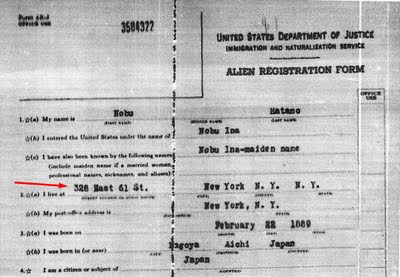 It gives the same street address as Nobu's Alien Registration form (see images below). So, this was her husband. His draft registration card gives his birth date as December 28, 1895. It says he is self-employed but doesn't give the type of business. It says he was from Saruhashi, Japan. WWII draft record for Hisatane Hatano. Arrow points to address (click to enlarge). From ancestry.com. I googled Hisatane's name and found him listed in a publication of Japanese Students at the Berlin University 1920 to 1945. It appears he attended during the school years 1921/1922 and 1923/1924. He studied "staatswissenschaft" (political science, according to Google Translate). I also found a passenger record for a Hisatane Hatano who arrived in the U. K. from Japan on April 30, 1921 (see image below). At first, I wasn't sure if this was the same person since the passenger record says he is a government officer and that he is 28 years old, making his birth year about 1893 rather than 1895 as stated on his WWII draft record. The passenger record says he planned to stay in England one month and gives his address as the Grosvner Hotel, Liverpool. 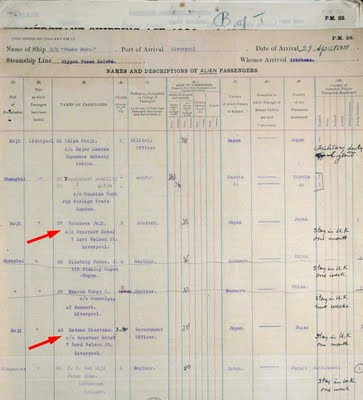 There is a student by the name of Juji Yokokawa listed on the same passenger record who also planned to stay in England for one month; he has the same address in Liverpool as Hisatane (see image below). The Berlin University record of Japanese students says Juji started there in 1921, the same year as Hisatane. Both men attended during the same school years (1921/1922 and 1923/1924). 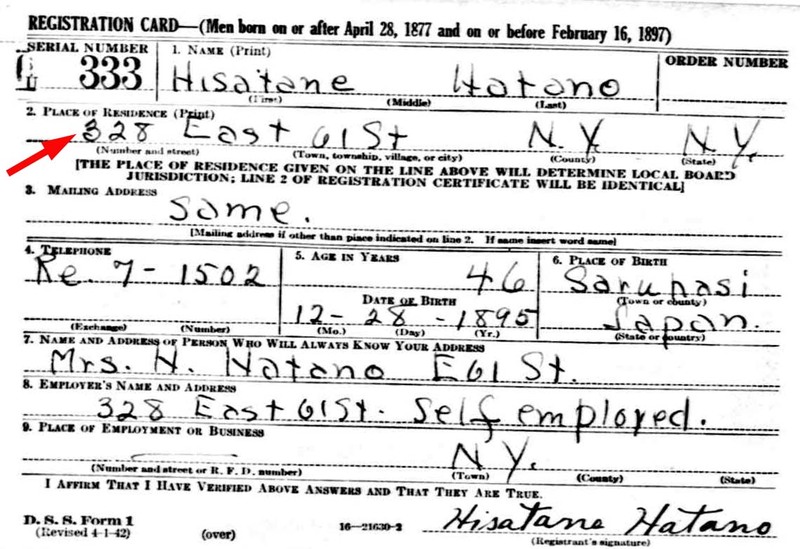 I believe that the Hisatane on the U. K. passenger record is the same person as the Hisatane Hatano that came to the U. S. in 1924. In looking back at the 1930 census for "Hay" Hatano, I noticed that the head of household is listed as Elsie Vonderschmitt from Germany. Hay is a roomer in her home (see census image above). Did he know her or her relatives in Germany or did someone in Germany put him in touch with her in the U. S.? Hisatane spent some time in Germany and could speak German. Hay's age in 1930 (34) is close to that of Hisatane (34 or 35). Hay could be a nickname for Hisatane. However, I still am uncertain if these two names are for the same person. U. K. passenger arrival record for Hisatane Hatano and Juji Yokokawa (click to enlarge). From ancestry.com. I found Hisatane's Social Security Death Record on ancestry.com. He died in New York City in May 1971. I hoped to find an obituary for him but haven't found one yet. This past March when I was visiting Valdosta, my youngest sister and I drove over to the Huxford-Spear Genealogy Library in Homerville, Georgia, to do a little research one morning but mainly to see what the library had to offer for future research trips. They have city directories from New York in their collection, so while I ran off to another area of the library, my sister looked through the New York city directories, but she didn't find anything on Hisatane or Nobu Hatano. In Part 4 of this series The Search for Nobu Ina, I'll continue my discussion with other avenues of research that I've tried. Ancestry.com. Year: 1930; Census Place: Manhattan, New York, New York; Roll: 1557; Page: 31B; Enumeration District: 453; Image: 100.0. Rudolf Hartmann. Japanische Studenten an der Berliner Univarsitat 1920-1945. Kleine Reihe 22. (Herausgegeben für die Mori-Ôgai-Gedenkstätte der Humboldt-Universität zu Berlin von Klaus Kracht, 2003). Ancestry.com. 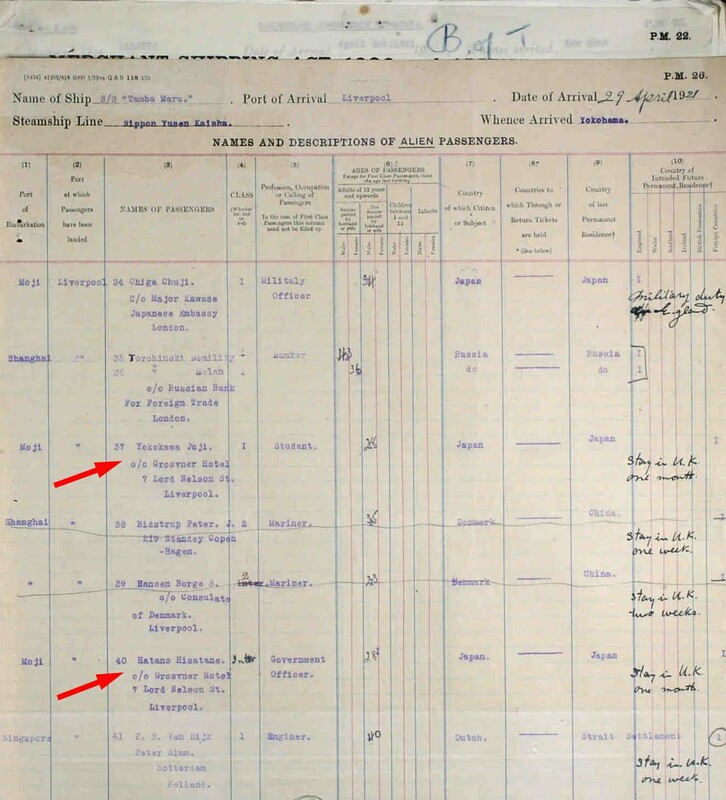 UK Incoming Passenger Lists, 1878-1960 [database on-line]. Provo, UT, USA: Ancestry.com Operations Inc, 2008. Ancestry.com. Social Security Death Index [database on-line]. Provo, UT, USA: Ancestry.com Operations Inc, 2011.